My Crafts are Like a Box of Chocolates – Page 108 – You Never Know What I’m Going to Make! This is just a quick post because I want to enter this photo in a challenge. Splitcoast gallery stopped uploading for me so here goes. 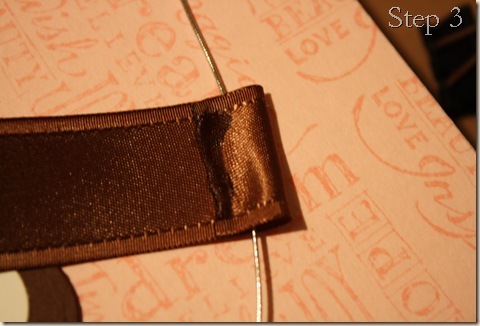 This is a double pocket bag; instructions from Splitcoast Stampers. The bookmark is created from a piece of cardstock longer than you can see, it is folded over in back and there are magnets between the folded section and the front. This helps the bookmark stay inside the book. Accessories: Basic Grey Magnets, brown grosgrain and satin ribbons, pink watercolour crayon, Prima flowers, rhinestones-unknown. All Products SU! unless otherwise noted. This card is a real departure from my usual cards but that is why I like doing Splitcoast challenges. Makes me move beyond my pink and brown or celery with plums comfort zone. This card fulfills Colour Challenge 195 and Cat’s Creations sketch challenge for blog candy. The card base is standard 4.25 x 5.5″ black cardstock. From now on I am just going to call this a standard card base. The next layer is Sahara sand stamped with a background stamp in the same colour ink. TIP: For the best results using a background stamp, swipe the ink pad across it, then tap it as usual. Be careful to fully coat the stamp in ink. Leave the stamp upside down on your table; place your cardstock face down on the stamp. Use your brayer to push the cardstock against the stamp. If any of the background is not covered by the cardstock and the reverse will show, cover with scratch paper before brayering. If ink gets on your brayer, clean as you would a stamp wheel. I distressed it with a Heidi Swapp distressing tool, the one that looks like a pink Pac-Man, and scissors. During that process the cardstock got wrinkled so I took advantage and crumpled it a bit more and inked the whole sheet. The folds get more ink than the valleys giving a nice texture. Can you tell I have been to Tim Holtz’ site lately? I really loosely followed the sketch; the sentiment was supposed to go at the bottom, oh well. I placed two ribbons, the ivory and the gingham, across the whole card, to me this represented the line on the sketch that was supposed to be the seam between two papers. I wish the ribbon showed more but at least it gave me a place to tie in the other three ribbons. I cut the oval cardstock layers with Nestabilities, love those! and adhered them to the card with black foam tape. The flowers are punched with the six petal SU! punch but I prefer odd numbers of petals so I clipped one out, hole punched the center with the 3/16″ Crop-a-dile and smushed the flower until the petals came together. The Scrapper’s Floss used to be medium brown but I didn’t like that it was the only thing on the card that wasn’t one of the featured colours; that might be OK if it was red or something, sort of an accent colour, but since it wasn’t, it just looked strange. So I coloured it with a Copic marker. Ditto the gingham ribbon, used to be black and white, I coloured it ivory with a Copic. After I got all of that done, it still looked a bit empty at the bottom, so I added the chipboard swirl covered in the same vintage book page as the flower. I used CTMH files to make the paper fit in the small areas of the swirl; they are quite sharp, worked very well and were quite cheap. The edges of the swirl were distressed with a black Copic. I added two brads to the end of the swirl; I really like how that looks. Accessories: ivory ribbon-Masterstroke, scrapper’s floss- Karen Foster, chipboard swirl- deluxe designs, E00 and black Copic markers, black gingham ribbon, black sheer ribbon, oval Nestabilities-Spellbinders, flower punch, black brads, black button, brayer All of the above by SU! unless otherwise noted. This is one of my favourite cards of all time! I think it is elegant and well, really pretty. I hope you like it too. The colours of the card are more vibrant in real life. Sorry! The base is close to cocoa 4.25″ x 5.5″, top fold. 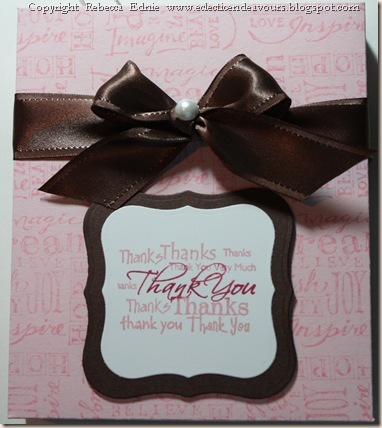 The next layer is Designer Series Paper (DSP) patterns in pink pirouette. Then comes a layer of chocolate dots from Bella Rosa DSP. The velvet ribbon I chose used to look pinker but the brown shows through and mutes the colour a bit, darn. I was going to use a soft, easy to tie ribbon and make a nice loopy bow or a soft tie but the ribbon I had was really wrinkled and I was too lazy to iron it. I was considering buying a ribbon iron when I remembered I have a mini iron I used for sewing so now I have to get that out. The wrinkling motivated me to start wrapping my loose ribbon on clothespins. I couldn’t find the old-fashioned ones so I used the regular ones. The pearls are from the Pretties kit adhered with Crystal Effects. I couldn’t decide if I should use two or three but I like it the way it is. The final layers are cut with… drumroll please… my new Nestabilities! Woo hoo! I just love them. If you don’t have them do anything, sell your… no, I was not going to say firstborn 😉 stuff you aren’t using on Ebay or Etsy.com to get these. The largest layer is chocolate chip followed by pink pirouette and white. Grateful is stamped in close to cocoa. The flower is coloured with Copics, I started with yellow on the flower petal tips and pink in the centers. I was happy with it until I worked on choosing papers for the rest of the card. I had the mix I wanted all picked out, however, when I put the flower on top I didn’t like it. The yellow was to bright even though I only used pale colours. So I used the colourless blender to push the colour out to the edges of the petals to soften it then added two more layers of pink. Now, I am happy with it. Thanks to Marianne of I Like Markers for the fabulous tips! NOTE: For future reference, I have a lot of Stampin’ Up! supplies so everything is usually SU! 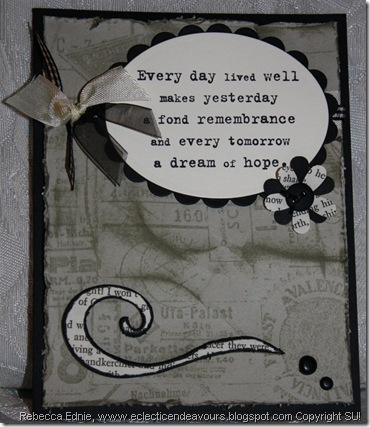 unless I note otherwise, especially if the tag at the bottom reads Stampin Up products. I can’t promise to be perfect, but my goal is to try and put the brand (or unknown) next to all other products! For my real favourites, I will link the products to the manufacturer’s website or an online store that carries the it. Hope the helps! 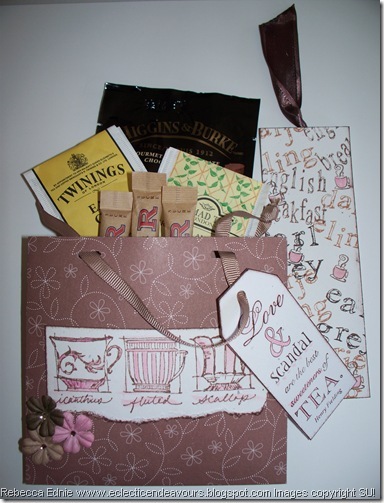 This box features the stretchy ribbon belly band from the last post. I think I slid the belly band up a bit after taking this photo. I really enjoy making boxes, this one is re ally easy; it fits a set of 10 4.25″x5.5″ cards and envies. I will post a how-to later. I cut the box lid according to my custom measurements then stamped the box lid with pretty in pink ink on pink pirouette CS with the word stamp from Natural Beauty. This has to be one of my favourite stamps of all time. Starting in the top left corner, I stamped it first horizontally, then vertically and repeated the pattern all over the box. This makes a great background, I have used it before on cards too. Then I assembled the box with red line tape. The box bottom is plain chocolate chip CS, you really do not see any of it anyway so I didn’t stamp it. The tag is made from my NEW NESTABILITIES! Yeah! The lower layer is chocolate chip CS, the upper is whisper white. The stamp is one of the first I ever bought, from Hero Arts I think. I inked it in pretty in pink then traced over the center thank you in rose red. 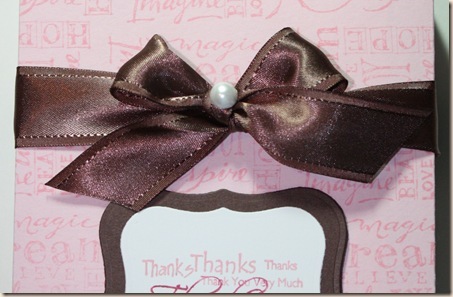 The ribbon is retired SU!, the pearl is from the Pretties Kit. 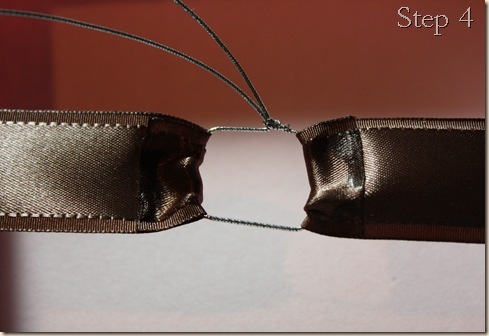 Step 1: Tie the perfect bow on your item. Trim the tails, do anything else you want like add other embellishments to the bow etc. Step 2: Cut the ribbon at the back, yep, cut it right in half. Being exact isn’t important. If your ribbon is polyester or nylon (most is unless it is real silk or cotton like twill tape) you might want to heat set it with your heat gun so it can’t ravel. Normally ribbon like this doesn’t ravel too badly because it is usually cut at an angle but this time it is cut straight across. Step 4: Place the bow on your box. Thread stretchy cord through the loops and tie. 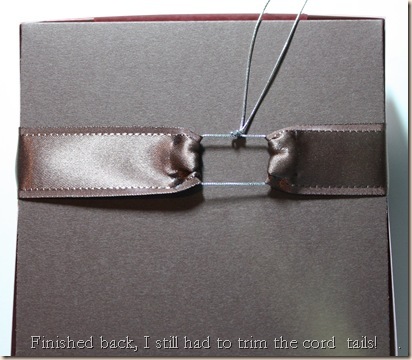 If your box is cardstock, be careful not to pull the elastic cord too tightly. You can see mine is a wee bit to tight in the last photo. This is the last card (so far) for my gift for my sister’s roommate. I would like to end up with 12 cards total (2 of each of three so far) but I want to make them fancy so I am still searching for ideas. So far, I am happy with the results but I continue to struggle to make them as fancy as some of the cards made by my favourite bloggers. I am waiting for my Nestabilities to arrive, seems the eBay seller goofed and sent them to the wrong address, GRRRR! This is a gatefold card. I used 5.5 x 8.5″ card scored at 2 1/8″ on both sides. The overall card still measures 4.25×5.5″ closed. The background paper is retired Designer Series Paper (DSP). 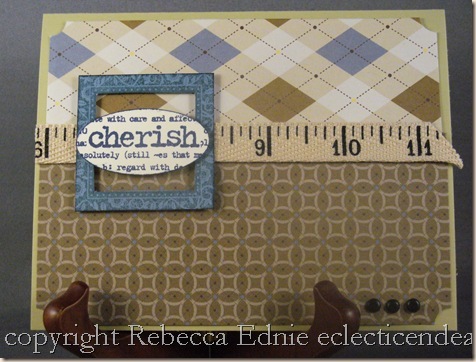 I used the directions HERE to cut the celery scalloped frame for the main image. The next layer is striped DSP. 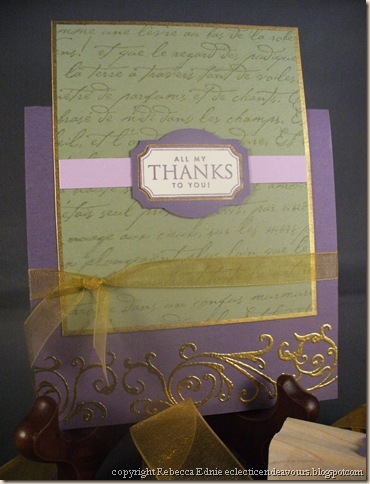 The focal image is ‘thank you’ stamped in perfect plum on vanilla CS. The swirl is stamped in pale plum with a Perfect Medium pen on the dots which were then dusted with purple Perfect Pearls. It is hard to see but gives the card a soft pearlescent look. The Perfect Medium has a fixative in it that keeps the Pearl Ex on the paper without a sealer. The corners of the vanilla panel have perfect plum and celery eyelets. I think I may go back and add a ribbon under the celery panel and tie it at the side of the card. Let me know what you think in the comments. This is another card for a gift for my sister’s roommate. I really love this little card. I didn’t really like making envelopes for them though so look for a post soon with my directions for making a ‘display’ envelope for your custom sized cards. The display style shows off most of the card as soon as the flap is opened. It can be adapted to any size card. This is a specialty trifold card. Go HERE for instructions for the layout. 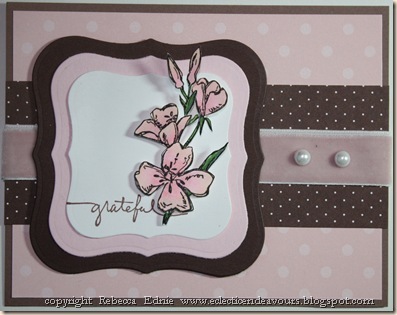 I made the card from pale plum CS with retired designer series striped paper. The bottom two layers are perfect plum and pale plum CS both stamped along the edges with the flower bouquet from Carte Postal in the same colour ink as paper, both were punched with the ticket corner punch. 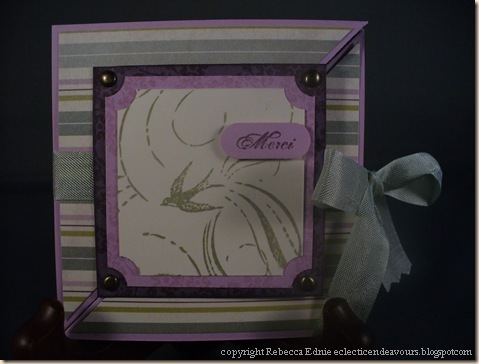 The top layer is very vanilla stamped with the French flair background stamp in mellow moss. ‘Merci’ from the same set was stamped in perfect plum on pale plum CS, punched with the word window punch. I reinserted the punched CS into the bottom of the punch to cut off the excess. Brads were added to the corners of the perfect plum panel and the ‘merci’ was adhered using foam dots. The card was adhered together according to the tutorial. I had a lot of fun putting this card together, I love interesting folds! This is one in a series of cards I am making for my sister’s roommate who just got married. This is a called a ten t fold card I believe. Either way, it is a fun and easy fold to do. 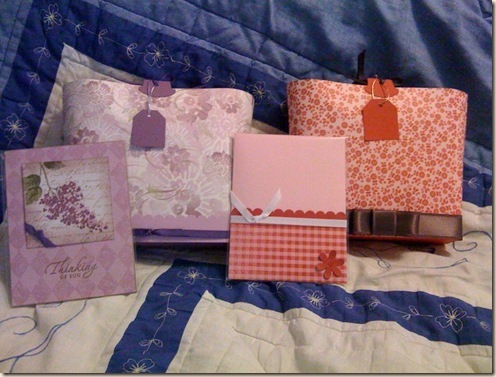 I started with a perfect plum 4.25″ by 8.5″ card folded in half with the fold at the top. I stamped Baroque border in Versamark and embossed with gold EP. I stamped French Script in mellow moss on mellow moss CS and edged it with gold marker. I have a special technique for edging CS. The marker has a chisel felt tip. Take a scrap piece of CS or thin chipboard and gouge out a groove in the tip. Hold the CS in the air and flex it so it will stay stiff. Align the groove with the edge of the cardstock; it will ride along the edge as you slide the marker down the paper. This gives you a nice even gold edge. TIP: hold the marker at a 45 degree angle to the paper for best results. the back will have little or no gold on it, repeat on the back if desired. I adhered the moss panel to the card so the overall dimensions of the card would be 4.25×5.5″. Next I cut a strip of pale plum CS slightly shorter than the width of the moss panel. I trimmed it so it would line up with the gold edge. I punched the label from perfect plum. 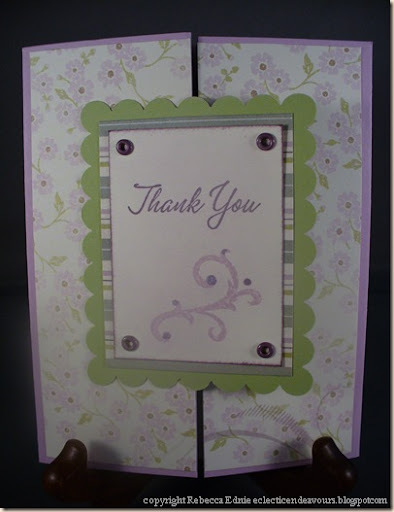 I stamped the thanks stamp and cut the center out, adhering it to the punched label. After adhering the label with foam dots, I realized the label looked a bit boring compared to the gold on the rest of the card so I used a thin tip gold paint marker to enhance the edge. Last, I added 3/8″ gold ribbon across the bottom of the moss panel. My next posts will show more of the cards that go in the set. Have a great weekend!